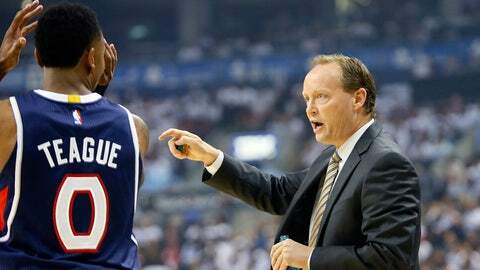 Mike Budenholzer isn't the only coach who's currently a member of the Hawks. It's probably not a coincidence that the likes of Byron Scott, Derek Fisher and Jason Kidd are currently NBA head coaches. The conventional wisdom is that point guards make the best team leaders, both when they're playing and after their days on the court are done. It's a sentiment that NBA GMs echoed this offseason in their annual survey, in which the top five candidates for future head coaches were all current point guards. So what about the Atlanta Hawks? Do any of their three point guards harbor dreams of becoming coaches when they're done playing? The Hawks' official team website put the question to Jeff Teague, Dennis Schroder and Shelvin Mack at one of Atlanta's final practices before the regular season tips off, and the three offered a variety of answers. Regardless of their feeling on the possibility of coaching in the future, one thing is clear. The Hawks are in good hands with their point guards, who are veritable player-coaches.